The whole coupon discussion got me to thinking about how sometimes we approach God's Word in a similar way. God's Word is full of good things, it tells us about an abundance of gifts and promises that God has for us. But, for some reason we don't want to take the time to clip out the coupon and use it, we don't want to ask! I wonder how many good and advantageous gifts God has with my name on them, but God, who will not violate my free will, is just waiting for me to ask and to keep on asking. The good news is, it's not too late for me, or for you either, to start asking today. Unlike coupons, God's Word doesn't have an expiration date. What a great message! You have such a lovely way of presenting your posts! Sigh....I wish I could write so eloquently (is that a word?) At any rate, I LOVE this message and your image with the Lantana is gorgeous!! Thank you so much, Cheryl, for your encouragement and thanks so much for clueing me in on the name of this beautiful plant! Ouch! This one is for me regarding God's gifts, His good and perfect gifts. I use coupons and now will be relating God's Word through a whole different lens. Thank you, Elizabeth. Thank you. Linda, I'm so glad that you were encouraged to ask more boldly through these words! Good point, Elizabeth! I know I don't ask God enough when it comes to me personally. I find it much easier to pray for others. I love coupons, too, as long as it doesn't require me to spend or buy more than I normally would to make it work! Have a blessed week! June, God is such a good and generous Father and wants us to have every beneficial thing. 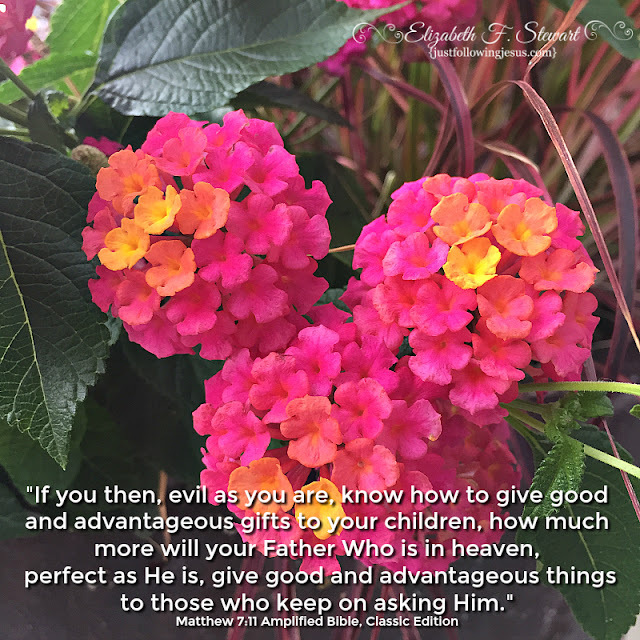 I think we can ask boldly knowing, like a good dad, He will not give us something that is not best for us, but is more than willing to give us what is beneficial.